If you are thinking of renovating your kitchen in the near future and you don’t know what to start with then it would be a great idea to replace your current kitchen countertops with brand new and more modern ones. Caesarstone and Silestone are two popular brands of quartz countertops and they are both excellent in this case. However, in most cases, Caesarstone is more appreciated by customers from all over the world and below you will find out why you should choose it before Silestone. Caesarstone has more quartz content in its makeup. These countertops are not 100% made from quartz, but they contain a high percentage of this type of natural stone and they are ideal for your kitchen or bathroom. Caesarstone is the winner in this case, simply because it contains 93% quartz content, in comparison with Silestone which features only 90%. Although the difference doesn’t appear very big at first, think about the fact that in the long run, your Caesarstone countertops will be more durable and resistant to wear and tear. Caesarstone offers more options when it comes to finishes. Both these quartz countertops brands excel on various aspects. For example, Silestone will offer you more options when it comes to colors. On the other hand, Caesarstone is more appreciated by customers because it offers plenty of alternatives when it comes to finishes, edge profiling and edging type. Basically, if the edge profile is very important to you, it would be a better idea to choose Caesarstone countertops. Caesarstone can offer a lifetime warranty. Yes, this is entirely true, although this type of warranty comes under certain terms and conditions. For example, in order for you to benefit by this convenient warranty type, you should maintain your Caesarstone countertops according to the instructions provided by the manufacturer. On the other hand, Silestone offers warranties which cover a much smaller period of time such as 10 years or even 15 years in some remote cases. Still, if you think that you can follow simple instructions, go with Caesarstone countertops and you will not be sorry! Caesarstone is more resistant to heat and pressure. Although both these types of quartz countertops brands are very durable and they can easily withstand high amounts of pressure and hot temperatures, a lot of homeowners say that Caesarstone is slightly better and more resistant to various damaging factors, so remember this if long service time is one of your main priorities when it comes to kitchen countertops. In any case, you will still be able to put a hot pan or kettle on your Caesarstone or Silestone kitchen countertops without being afraid that you will damage them. Similarly, these kitchen countertops are resistant to knife cuts and scratches too! 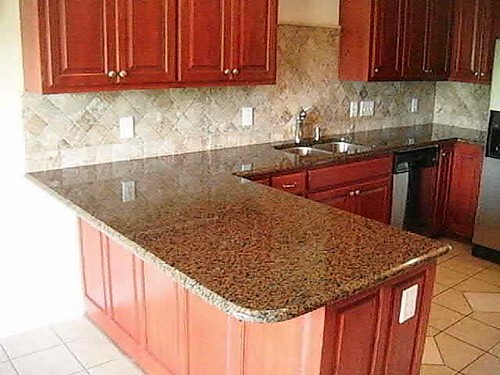 you want to invest in kitchen countertops of the best quality then make sure that you go for Caesarstone. Our company sells Caesarstone kitchen countertops at very attractive prices and you can also choose from a variety of models and designs. Give us a call today and we will help you make the best decision.